Years adding up to #10 are represented by the Wheel of Fortune. This year opportunity and new horizons keep your life spinning with regular change and new perspectives. The Wheel of Fortune year encourages you to gather experiences from all areas of your life and mold them into new prospects for your future. Creative communication and a willingness to move on are integral parts of this year’s energy. Don’t get stuck in a rut – it’ll drive you crazy. And if you do feel trapped, the faster you shake things up the better. The world never stops, and neither should you. The Wheel of Fortune year brings good luck and a great chance to do things a little differently than usual. 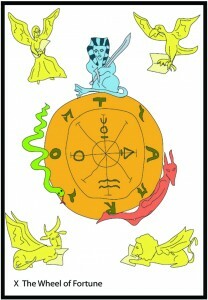 The shadow symbols for the Wheel of Fortune are the Sun and the Magician. § 6 Responses to Growth Year #10 – Wheel of Fortune"
This is my year starting on the 2nd of December! What a great card. I have recently decided to go forward with plans that I began to put in place eight years ago, so this card is encouraging, as are the shadow cards. Happy Birthday (soon) and Good Good Luck to You!! My birthday is February 3 and this year I will be experiencing the Wheel of Fortune. I am sooooo ready for a change. I realize it’s supposed to occur from birthday to birthday but three days ago my father passed away. He was getting less and less independent and I really thought 2012 would be about taking care of him but the Universe had different ideas. The Wheel has already turned. Thank you for offering a positive “spin” on this card for the year. Hi Mel – I’m so sorry to hear about your father. What a terrible tragedy over the holidays. And yes, the change in energies seem really obvious in your case. I wish you the very best that the Wheel Year has to offer – good luck, new beginnings, new opportunities, and a chance to begin a brilliant new phase in your life. Lots of love and strength to you and your family. curious to know more about the shadow symbols of the wheel –how the sun & the magician play this role. in what aspects are they shadows for the wheel? thank you! Hi Stasha! Thanks for the questions! I see shadow cards as representing energies that are an important part of a particular growth year, but they’re more in the background then the main card that describes that year. I see them as sort of pushing the main card forward, and giving it some extra power from behind. For instance, if the Wheel of Fortune is your growth year, some of the main themes that year might be luck, new opportunities, trying things differently, and taking chances. In the background though would be the Magician and the Sun. The energies of the Magician would be there spurring on new opportunities with his ability to focus and willingness to think outside of the box. While the Sun card brings the Wheel openness, serious potential for success, and an element of fun that balances out the intense focus of the Magician. These three cards like to work together, and depending on which year you’re in, one will be highlighted more than the others. I hope that makes sense. And obviously, it’s just my perspective on it.